Charlie Bears Kekkezza Discounts Apply ! Designed by Isabelle Lee for Charlie Bears 2016 Plush Collection. Keeley and Kekezza are both named after two bear cubs who work here at the Bearhouse. Not your traditional panda but panda�s none the less. 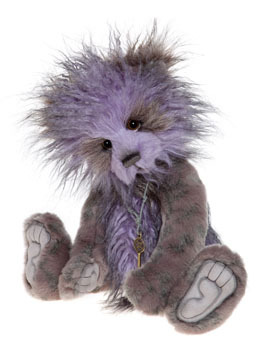 Kekezza is made from two types of plush, a short pile patterened plush to her arms and legs in tones of lilac and dark purples and a thick long pile purple plush tipped with dark grey. Sculpted paw pads, tickly toes and a hand embroidered smokey grey nose add to her design. Kez as she is known to her friends is fully jointed and so can strike a pose very easily. Kekezza actually means Heather in Cornish .